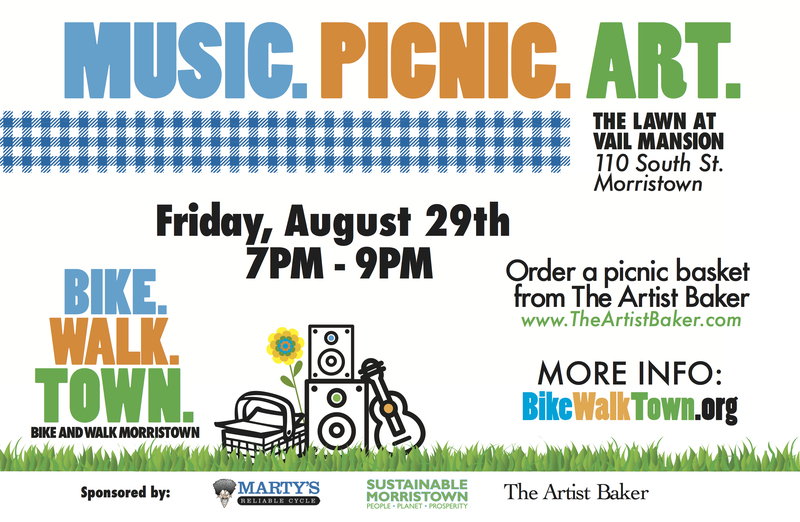 After the Morristown Critical Mass & Bike Party on Friday, August 29, join Bike & Walk Morristown on the lawn of the Vail Mansion, 110 South Street, for our annual Music.Picnic.Art summer party. This party is free and open to everyone who wants to come! The Artist Baker is helping host Bike and Walk Morristown’s annual fundraiser; a special picnic menu for the event is available, and all orders through them will help fund our bike and pedestrian projects in Morristown. Feel free to bring a picnic from home or from your other fav Morristown restaurant. This family gathering will include picnickers on the lawn, music with the Allamuchy Sheiks (the last of the psychedelic jug bands), and art created by local artists . Our partners for the event are The Artist Baker, Sustainable Morristown, and Marty’s Reliable Cycle. The bike party ride starts at town hall parking lot at 6:30 and will end at the lawn at Vail Mansion. We are taking orders for the picnic till Wednesday, August 27th. ￼We will deliver the picnics to Vail Mansion by 6:30. All meals will be delivered in eco-friendly take out box and cups. Drinks will be available through Bike Walk Morristown for a donation. Please call The Artist Baker to place your order 973-267-5540.